SJSU Strategic Planning: Dreams, Plans, and the Future. Faculty, staff, and student participants of Campus Conversations, held on campus between September 20-22, as part of the strategic planning process. San José State University President Mary Papazian set a tone of inspiration at The Strategic Planning Kickoff Event held on September 14. 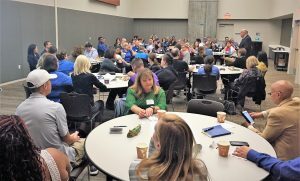 The on-campus event, meant to motivate participation in this year’s strategic planning sessions, gathered more than 300 faculty, staff, administrators, campus leadership, and students. In her opening remarks, President Papazian suggested attendees consider the process to be one of strategic dreaming. Provost and Senior Vice President of Academic Affairs, Dr. Andy Feinstein, reinforced the President’s remarks and likened the process ahead to the scholar Joseph Campbell’s hero’s journey. The kickoff event was followed the next day, September 14, with the Leadership Forum. Approximately 80 participants made up of cabinet members, deans, AVPs, seven staff representatives, three representatives of the Academic Senate, three students, 23 chairs, and three Alumni Association members gathered to bring President Papazian’s message of dreaming and planning to action. One question Professor Agee and her colleagues discussed was: You have the opportunity to talk with a donor. What ideas would you pitch? At the session for tenured faculty on Wednesday, September 20, President of the California Faculty Association and Professor in the College of Social Science, Dr. Preston Rudy, pointed out the general desire to support student achievement that informed his session’s vision of the future. In total, 76 MPPs, three chairs/tenured faculty, 14 lecturers, 101 Staff, 21 tenured and 15 tenure-track faculty members attended Campus Conversations. Overwhelmingly, participants credited campus leadership for the invitation and its inclusive gesture and were confident that President Papazian and Provost Feinstein would ensure the strategic planning process was transparent and authentic. Students also showed their Spartan Pride at the student Campus Conversations over 100 RA’s and 40 other, largely undergraduate, students attended. The next steps for the strategic planning process include the creation of an online survey, asking faculty, students, and staff six questions designed to replicate the information presented at the Campus Conversation sessions and to recruit up to three GE courses in which to conduct the same strategic planning exercises which occurred in the session. Additionally, the Strategic Planning Steering Committee would especially like further input from the lower division, graduate-level, and commuter students. Comments Off on SJSU Strategic Planning: Dreams, Plans, and the Future.